On How to Encourage Your Son to be a Gentleman, author Ken Myers provides six suggestions to teaching your preschooler how to act with good manners. One of the suggestions is to realize that good manners start with compassion and empathy. Modeling compassion and empathy is critical and very hard. Our kids hear us when we make a comment about another driver. They hear us if we disparage a waiter or waitress. I find myself needing to remember that there are ears everywhere and everything I do is teaching my children. Treating people with respect and managing my own frustrations are among the most important things I can do to teach my sons how to be gentlemen. University of DenverBut realistically, while I hope my husband and I are the most influential of my childrens' teachers, we are not the only ones. We aren't even the ones with the most time with them during the week. A lot of learning to be a gentleman (or a lady) will come from the expectations of their social circle. Our kids hear other people (kids) make comments about themselves. Elementary school kids experiment with sarcasm and humor. It's not natural to expect that to stop. The question is how to teach your child the impact of their behavior and language while they are constantly exposed to other children doing exactly what I've conveyed (and teachers convey) is unacceptable. 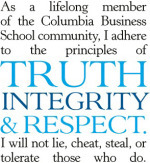 Columbia Business SchoolI've begun to believe that there is a role for honor codes. Explicit. Articulated. Discussed. A code describing what is acceptable behavior for a group or class. A code that can provide a framework to discuss changes to the code and behaviors or words that may not fit the code. Honor Codes are visible. They go beyond behavior and into values and principles. The ones I see are about cheating. This is a good thing - but that doesn't cover what it means to be part of a honorable community. But they are simple. Done well, they are short, memorable and referenced constantly by students, teachers and parents. I see them in boys schools, military academies - but not frequently in co-ed or public schools. I'd love links to honor codes that are effective - does your school have one? What do you think - how does the village teach children how to be well-mannered adults? Imagine sitting in a classroom and hearing all the noises in the room as if they were in an amplifier next to your head. And then imagine trying to follow the teacher's directions through all that noise. Imagine trying to figure out what the teacher said when you miss 30% of the words or the words themselves become garbled in your mind. Imagine you cannot quickly recall what someone just told you. In fact, after 10 minutes of experiencing these things in a simulation, I had a splitting headache and felt homicidal. It was exhausting. A year ago, testing showed my son had an auditory processing deficit - and that his ability to process auditory information was dramatically lower than all his other intellectual abilities. It wasn't until a chance conversation with an Otolaryngologist that we realized we could understand the details of this deficit and potentially help. We had him screened by a pediatric audiologist who diagnosed him with Central Auditory Processing Disorder - CAPD - a disorder that impacts 2-5% of the population with twice the incidence happening in boys. It's often undiagnosed because the children can hear well. In fact, many children with CAPD act out in school because they are so frustrated by what they hear or they just need the sound to stop - leading to being designated a "bad" or "wild" child, "willful" or "ADHD". ADHD can exist with CAPD - but they aren't the same thing. We are very lucky. Our son's CAPD did not coincide with reading dyslexia or speech issues. In fact, so far, it's only really impacted his behavior. As soon as we received the diagnosis, it was recommended that he complete Auditory Integration Training. This therapy was developed by Guy Berard, MD and consists of frequency optimized 30-minute intervals of music where they modulate the treble and bass as well. The sounds train the brain stem - and help address imbalances in processing sound. My son's AIT focused on reducing the volume of sound at 4000 Hz - the frequency of crowds. He diligently listened for 30 minutes every morning before school or sports and 30 minutes every evening. The results from the mid-program audiogram were amazing - and when we drove to Montana after he completed the program, he sang on key for the first time in his life. It will take anywhere from 1-6 months for the full impact of AIT to be seen. In the meanwhile, he has to learn to restate what he hears, advocate appropriately for himself when the sound is too loud and we have to work with his teachers to have compassion, provide him information in visual modalities, and help him unlearn the behavior patterns he developed out of frustration. The coping mechanisms that he uses to excel academically must be reinforced as the work becomes more challenging - CAPD is a lifelong disability, but it doesn't need to hold him back. To learn more about identifying and treating CAPD - here are some resources. What are Central Auditory Processing Disorders in Children? My son is having a rough school year - and many days he's disruptive in class. We know about it. We're working on it. My son is bright, athletic and unfortunately, quick tempered with the tendency to react physically. He runs away. He’ll hit someone. Sometimes he’ll curse (which is actually an improvement, but still not appropriate). We’re working with his school to help him develop the emotional maturity to express anger and frustration rather than act on it. We know that by the time he’s nine, it’ll be better. But he’s seven and it wasn’t a big surprise when the sleepaway camp sent an email that he was having some “behavior issues”. Most impressive was that they asked for strategies to help him succeed. My son isn’t particularly unique – his emotional development is normal. Average. Unimpressive, but not clinically delayed or anything. And the motherhood manual doesn’t include strategies to help a little boy react older than he is. So – here’s my addendum to the motherhood manual – my top ten tricks for managing a 7-year-old boy. Tried and true, goal oriented boys like to have a target to reach. Create a reward chart for the bunk, group, siblings or class so that they can support each other. Make tasks that they need to do together in order to succeed. Make the reward something they really like – a pizza party, ice cream social, extra baseball game. Make the group a team. Find a way to get them to “score”. When they aren’t in the game, can they score by cheering for their friends? Who is the loudest cheering “team”? When they are waiting at the flagpole or before a meal, is there a game about finding the coolest cloud in the sky or the biggest leaf on a tree? They like to compete. Have them work together. Routines make children feel secure. They need to know what is going to happen and when – how long will they have to wait? When is the next game? Tell them the routine, try to make it consistent from day to day and if the routine involves time, give them a way to tell time (position of the sun or shadows is fun). Responsibility breeds self-respect. Each member of the bunk can have a job. They should know what their job is (line leader, bathroom inspector, laundry distributor, ball collector, game organizer, etc). Their job might aid in achieving the reward chart. Few boys will ever want to sit out of part of a game, even if they should. Explain up front that during the game, you may get called out and when you are called out, you need to go to the sidelines quickly and cheer. And then, when the game is over, we’ll start a new game and everyone can play. Except in a tournament when you are out for good. Then you cheer! Boys often do not have an extensive emotional vocabulary and its important not to talk him out of his feelings. If he’s mad, let him be mad. Talk about how it feels to be mad and what made him mad. Then ask him what he can do about feeling mad. Until he decides he doesn’t feel mad anymore. Idle hands go wild. So – if there is waiting in line, give them something to do. Sing a waiting song…do pushups…strike a pose…climb a fence. Anything that keeps the hands active and not on each other. My son does especially well when he feels responsible for someone else’s well being. It could be the dog but it’s better if it’s another child. He’s an attentive friend and big brother if he’s needed. Pair boys up and give them the responsibility to help each other make good choices. Even though it might get mind-numbingly boring or infuriatingly irritating, you have to watch them and interfere if they cannot resolve a conflict. It’s a delicate balance between helicoptering and Lord of the Flies. But if a situation is escalating, try not to resolve it – just introduce new words to redirect it. He’s a little boy trying to act big. He needs a hug. A lot of hugs. He doesn’t know to ask for them – but he needs someone to wrap their arms around him and hold him tight for a few minutes so that he feels safe and loved. What would you add to the manual? Any techniques work for you and your active boy? My son started kindergarten with exuberance and within a week was sullen. Soon after, we started receiving notes from the school that he was harassing three girls. As a consequence, he was not allowed to run on the field; he had to stay on the playground so that he and the girls could be separated. He was devastated. We were confused and concerned. We believe in logical consequences and if he was bringing these girls to tears, he had to be restricted. But it was totally out of character. In 5 years of day care and pre-school, he never bothered, harassed or did more than horse around with another child. Nothing I’ve experienced in my life compares to the hurt I felt when my son was hurting. We couldn’t figure out what to do. We talked with him – but he couldn’t explain what was happening. We didn’t know if one of us should stop working to help him to figure this out. We asked the teachers to tell us what they saw. I even tried to surreptitiously observe recess. We asked friends and parents for ideas. Maybe he was too young for school. Then my husband tripped on a toy train and put his arm through a plate glass window severing his ulnar nerve. His reluctance to tell many people how he got hurt led him to sequester himself with the children at a community event and he saw an older girl, a third grader, approach our son. “Please, chase me!” she goaded. And he did. Caught and tagged her. Then she burst into tears and headed for her parents. She didn’t count on being observed and intercepted by his Dad. My husband told her he saw and heard everything. After a feeble attempt at denial, she acknowledged that she was asking my son to chase her. It was a game – three third grade girls discovered they could control the teachers by provoking my son to chase them, crying about it and getting him punished. He was just 5 and had no way to put together that the invitation to play tag was the bait to get him in trouble. Suffice to say, the game ended that night. My husband spoke immediately to two of the girls’ parents (with the girls whimpering alongside) and I informed the Head of School about what was transpiring. To the Head’s credit, he immediately apologized; spoke to the on duty teachers and the girls and the behavior stopped. And that same day, my exuberant, giving child re-emerged. Zero tolerance was punishing the WRONG child. It’s so much harder to observe and prevent verbal/emotional bullying. Kids are smart and they hide it. I wonder how else we could have figured out the problem. Any ideas? The first week of October featured a flurry of discussion about bullying in the US – Newsweek , People Magazine, CNN (a week of coverage on bullying). I was saddened and shocked by the children who committed suicide after bullying.